Free informative Indicator-helper. It'll be usefull for traders who trade many symbols or using grid systems (Averaging or Martingale). Shows distance to nearest TakeProfit on current chart. Max Drawdown To Send Email - the drawdown value that you can specify, upon reaching which an email will be sent. Set = 0 to turn off. Max Open Orders To Send Email - max open orders to send the mail. Set = 0 to turn off. 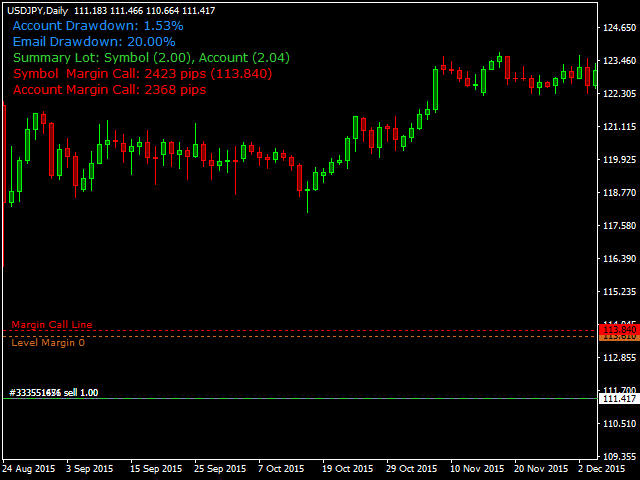 Show Margin Call - if true, the MarginCall line and its value will be displayed on the chart. Show Lot Info - Show summary trade lot of all orders on the current pair and account in general. Show Near TP&SL - display the information on the remaining number of points to Take profit/Stop Loss of the nearest order. DrawdownColor, LotsInfoColor, TPInfoColor, MarginCallColor - set colors of the text labels. - added lable for counting orders. - Corrected the logic of sending messages and reset of global variables. 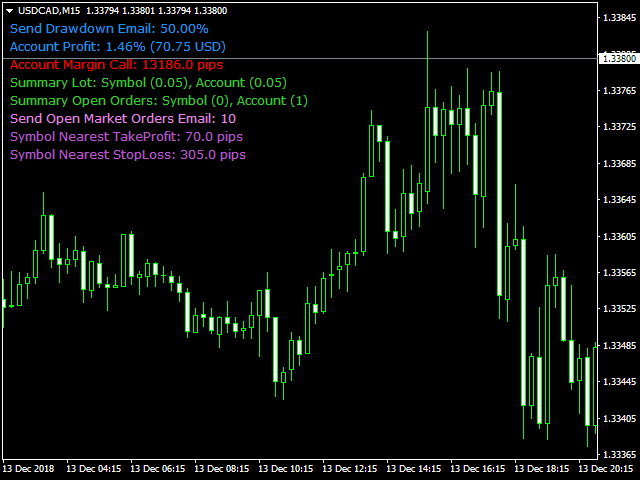 - Added calculation of the shortest distance to StopLoss. - Added label which shows distance to the nearest take profit on the chart. - Added ability to select the text color. 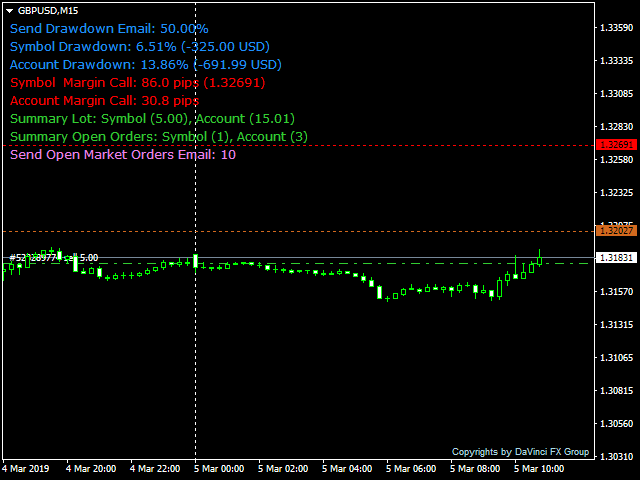 - Added MagrinCall data and line display setting. Now, you can clearly see how many points a symbol has yet to go before the deposit is completely lost. Sending emails is now managed by a global variable: if the indicator is placed on several charts, ony one message is sent from the chart of the symbol where the drawdown value specified in the settings is the least of all indicator values. Sending messages is resumed after the drawdown level is halved. If you detect an error or freezing, please contact me, so that I can improve the indicator operation.